You’ve probably heard the following statement: “IF YOU DON’T PAY, YOU ARE THE PRODUCT!“. In fact, when you are using free Internet services, chance is high that your personal data is being sold to advertisers. This information is often used to deliver targeted ads. The price paid by advertiser to deliver an ad actually depends on the user’s profile and interests. The goal of this project is to evaluate how online advertisers value users according to their profiles, including their Web Histories, interests and locations. We found out that the price paid to serve an ad is very low and is equal, on average, to approximately $0.0005!!! 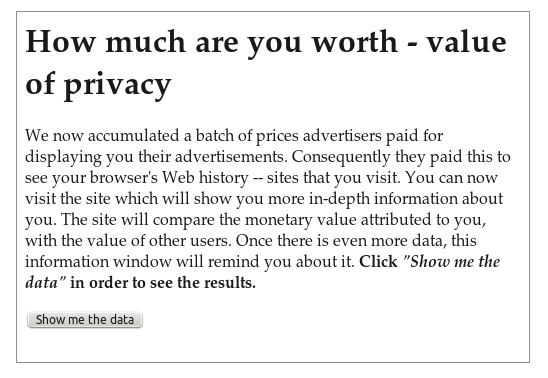 … but YOUR price can be much lower or higher according to the value of your profile (more info. in our NDSS’14 paper)! 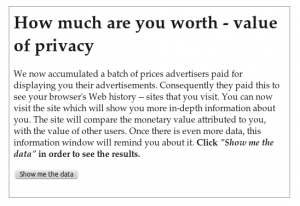 For Firefox or Chrome Users: Do you want to know how much you are worth? Do you want to know whether you are more worthy than your friends or other Internet users? Do you want to know your ranking? Install our Firefox plugin (HERE or on Mozilla official site HERE) or Chrome extension (HERE using using this guide). Note that additionally, the Chrome plugin also collects general information about the numbers of ads seen in all the visited Web sites and display an estimated cost of all your ads. The plugin periodically submits data to our servers. -option1: deactivate your Abblockers, browse the Internet as usual, and reactivate your Adblockers whenever enough prices are collected (i.e. our plugin starts showing you your average price). This could take a couple of days. –option2: deactivate your Abblockers, clicks on some (10 to 15) of the links here, and reactivate your Adblockers. This option is faster, but might somehow affect the results. After a RTB (Real-Time Bidding) auction took place, the Ad Exchange usually informs the winning bidder about the price it has to pay by sending it a price notification. We detected that many such notifications happen through users’ browsers, and leverage this feature to capture winning prices. These prices reflect how advertisers evaluate the value of each individual user according to their profile. Users’ profiles are typically built by advertisers by tracking users’ browsing activities across the websites on the Internet. Our plugin collects the prices paid by advertisers to deliver ads to YOU. It then computed the average value and your rank within the participating users. You will then be able to see how valuable your data profile is compared to others. A more detailed technical report is available here. The plug-in only collects winning prices in Real-Time Bidding (RTB) auctions. Each user is identified by an identification number which is randomly generated by the plug-in at installation. Data sent to our servers are composed of this identifiation information, the collected prices and advertisers’ domains (e.g. criteo.com) and HTTP parameters whose values contained clear-text prices (e.g. “wp=”). 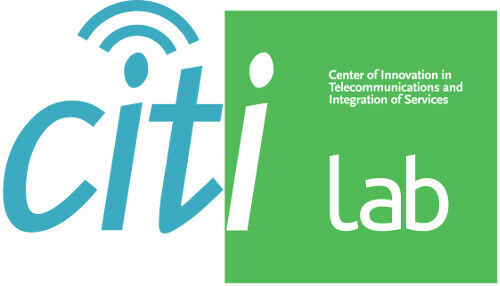 These information is used to compute various statistical values that are displayed to users. We only collect advertising prices, and do not collect (and actually don’t even see) any personal information or any information related to your online activities, such as the sites that you are visiting. We include here a list of sites which we observed most frequently triggered clear-text winning prices. By visitting these sites you can very likely accelerate the price collection and analysis.